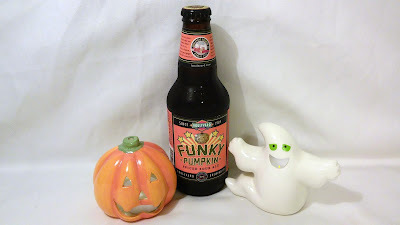 Jared Unzipped: Brew Spew 2015 Part 2: Boulevard Brewing Funky Pumpkin Spiced Sour Ale. Brew Spew 2015 Part 2: Boulevard Brewing Funky Pumpkin Spiced Sour Ale. Here we are, the second Friday of October. That can mean only one thing -- the latest installment of the BREW SPEW 2015! Tonight, I'll be highlighting a rather strange fall seasonal beer from Boulevard Brewing Company of Kansas City, Missouri. 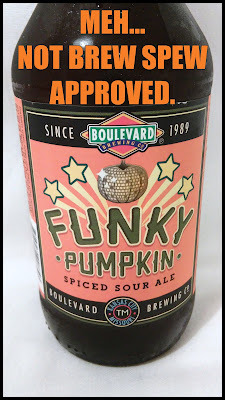 The Funky Pumpkin Spiced Sour Ale is the inaugural release from Boulevard into the booming pumpkin ale market. Founded in 1989, Boulevard Brewing is currently the largest specialty brewer in the Midwest. They are most notably known for their GABF® Gold Medal-winning Unfiltered Wheat Beer, which is a high volume seller throughout the Midwest. Funky Pumpkin Spiced Sour Ale will be available in September and October annually. It is 5.8% Alc. by volume. As with my first article in this series (which you can read here), I will evaluate the beer in two parts. My comments will be recorded in real time. My opinion will be honest, direct and I will tell you exactly what I think, good or bad. Has the faint smell of nutmeg and cranberries. When they said it was sour, they weren't kidding. It has a light yellow color. Not frothy, with just the right amount of carbonation. Leaves a slightly bitter aftertaste in your mouth. The nutmeg and allspice is somewhat present when you first begin to drink. As you continue to drink, the sourness really begins to take over. The pumpkin flavor is very light and totally overpowered by the sourness. Reminds me of a piece of very sour hard candy without any of the sweetness. The cinnamon, nutmeg and other spices are more easily detectable by the tongue. The sourness, though still present, is only slightly less bold. A sweetness has developed where there wasn't one before. The aftertaste retains the sour flavor, but also some of the spices. I can't accentuate enough just how sour this beer was. After drinking it, I did some digging into what made it so twangy. Apparently, Boulevard relied upon an old traditional method used in some Belgian ales that employs Brettanomyces for the yeast element. Brettanomyces is a non-spore forming Genus of yeast. It is generally not wanted in beer because it can influence the flavor in some unsettling ways. One such manner is that it will make a beer taste extra sour, as with the Funky Pumpkin Spiced Sour Ale. Boulevard purposefully added this particular Genus of yeast to make the Ale pucker your mouth. My final thoughts? You should definitely not drink Funky Pumpkin Spiced Sour Ale cold. It's just not pleasant. I wouldn't buy this beer at a bar for that very reason. If I were in the mood for something different, I might consider buying another bottle in the future. Might.